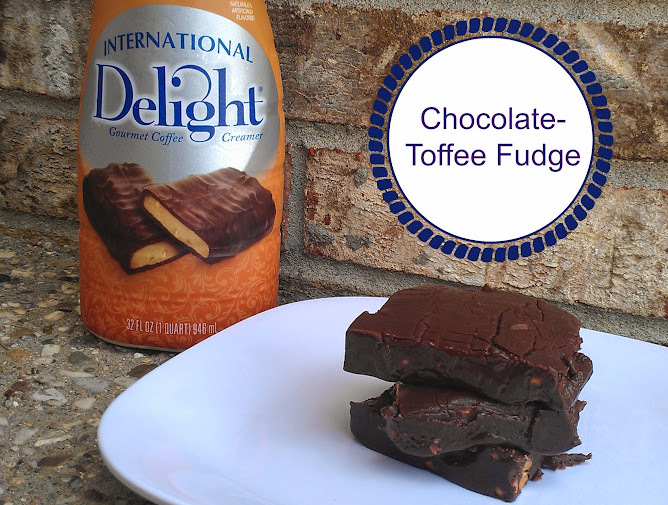 I love using International Delight creamers in my recipes for this reason. They have so many flavors to choose from! One of my absolute favorites is the Heath flavor. I mean, you can’t go wrong with chocolate and toffee, right? Heath bars have always been near the top of my list for candy bars. I have a lot of childhood memories of my Mom cooking with them. She used them in her Chocolate Trifle, to top her Ice Cream Bars, and lots of other ways. So when my husband recently suggested that I make some fudge, I thought I’d add in the I.D. creamer and see what happened. The results were really yummy. 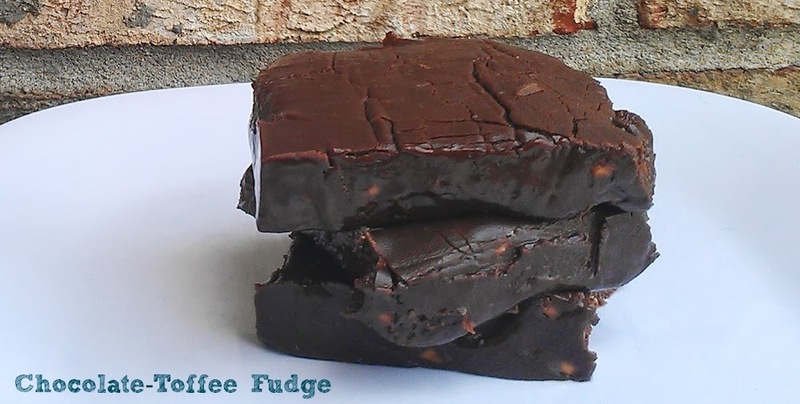 Okay, in my opinion, they were more than yummy: I feel like I created pretty much the best homemade chocolate-based fudge I’d ever tried (I can’t say fudge, period, because my Grandmother makes world-class peanut butter fudge). Spray a 9×9 pan with cooking spray and set aside. You can also line it with parchment paper for easy removal, if desired. 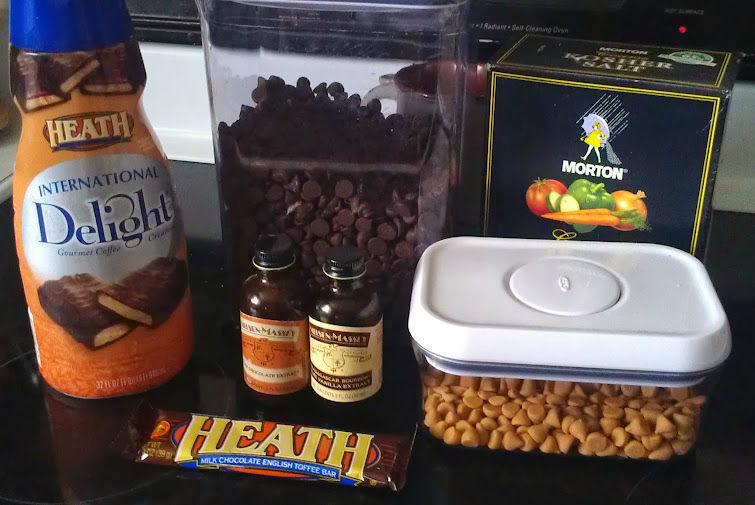 Place chocolate bits, ID creamer, both extracts, and salt in a microwave-safe bowl. Microwave on HIGH for 30 seconds; stir. Microwave for another 30 seconds on HIGH and mix thoroughly. If ingredients are not completely incorporated at this point, continue to microwave in 15-30 second bursts until smooth. Keep an eye on the mix, as chocolate can go from “almost there” to seized, gritty and hard in the blink of an eye. Add butterscotch bits and mix until fully melted and mixture is smooth. If you are unable to get all the butterscotch bits to melt, microwave for 15 second bursts, stirring thoroughly after each, until desired consistency is reached. Mix in crushed Heath bar. Pour fudge batter into prepared pan and refrigerate for at least 2-3 hours, or until set. It’s best to refrigerate overnight if possible. This stuff is so good it’s sinful. The fudge practically melts in your mouth, but then you get those great little nuggets of crunch from the crushed Heath bar. Heath is MY I.D., but I’m curious – what’s yours? International Delight would also like to know the answer to that question. Head over to the What’s Your I.D.? website and share your favorite flavor with them. You’ll have the chance to win tons of instant win prizes like gift cards or International Delight-branded gear, weekly prizes like a $500 gift card or baking kits, or even the grand prize: a magical trip to Orlando!